President Trump on Wednesday claimed credit for a sharp pullback in oil prices over the last five weeks. Oil prices tumbled from four-year highs last month amid a broad sell-off in global markets, rising output from key producers and a deteriorating outlook for oil demand. Wall Street widely blames Trump's sanctions on Iran for pushing oil prices to nearly four-year highs in the first place. President Donald Trump on Wednesday claimed credit for falling oil prices, glossing over market forces that knocked crude futures from four-year highs last month. The president did not clearly elaborate on why he deserves credit for the pullback in oil markets, but he linked falling prices to his disdain for the 15-nation OPEC cartel and his administration's Iran policy. The Trump administration on Friday announced it would grant sanctions waivers to eight countries, which allow them to continue importing Iranian crude for 180 days without fear of reprisal from the United States. The Trump administration restored sanctions on Iran, OPEC's third-biggest oil producer, on Monday. "I gave some countries a break on the oil," Trump said during a lengthy, wide-ranging press conference the day after Republicans lost control of the House of Representatives in the midterm elections. "I did it a little bit because they really asked for some help, but I really did it because I don't want to drive oil prices up to $100 a barrel or $150 a barrel, because I'm driving them down." "If you look at oil prices they've come down very substantially over the last couple of months," Trump said. "That's because of me. Because you have a monopoly called OPEC, and I don't like that monopoly." Oil prices have tumbled as much as 20 percent from four-year highs on Oct. 3. However, the decline since Trump officials first announced the waivers on Friday has been significantly smaller — about 1 percent for international benchmark Brent crude and 3 percent for U.S. crude. Much of the losses in the oil market over the past five weeks correlate to a sell-off in global markets that saw investors dump risk assets including crude oil futures. During the October swoon, the S&P 500 posted its worst monthly drop in seven years. Another factor that took the froth out of the oil market last month was the growing consensus that global oil consumption will not expand as much as previously anticipated. Forecasters are knocking down their projections for oil demand due to concerns about global economic growth because of Trump's trade dispute with China and currency weakness in emerging markets. Trump can claim some credit for the third factor behind the oil price pullback. Output from Saudi Arabia, Russia and other crude-exporting nations is on the rise, and analysts generally believe that's in part because the Trump administration asked the Saudis to pump more oil to offset the impact of sanctions on Iran. OPEC and its oil market allies were also concerned that rising prices would shrink demand for oil. That's another reason the producers agreed to increase output earlier this year, partly reversing a policy of limiting supply. That policy, in place since 2017, helped end a historic oil price collapse that punished U.S. energy companies and oil-exporting nations alike. While Trump frequently criticizes OPEC publicly, his administration actually depends on the cartel to offset the impact of its Iran policy. Specifically, Trump relies on top exporter Saudi Arabia to leverage its influence over other OPEC members to increase output and prevent oil prices from spiking as Iran's exports dwindle. In fact, oil market analysts broadly view Trump's decision to restore sanctions on Iran as a major catalyst for higher crude costs. Oil prices ran up about $7 a barrel in the month before Trump announced he was abandoning a nuclear accord with Iran and restoring sanctions on the Islamic Republic. 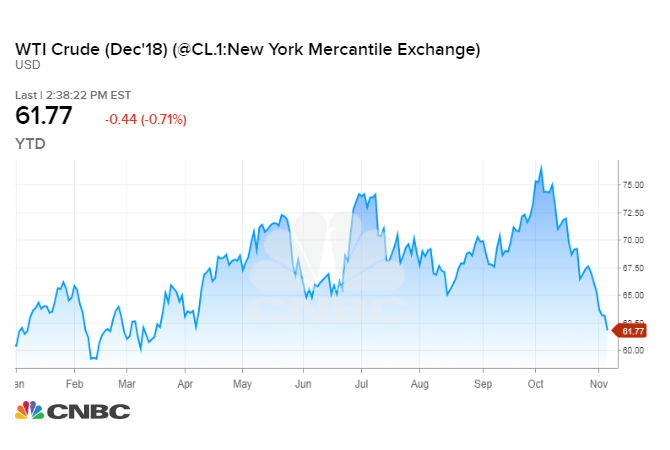 Last month, uncertainty around the severity of the sanctions and their impact on global oil supplies pushed U.S. crude to nearly $77 a barrel and Brent to more than $86, their highest levels since late 2014. "The rally has been driven by fears that the decline in Iran exports exceeds remaining OPEC spare capacity," Goldman Sachs wrote last month. "Key to short-term fundamentals — and price action — is the risk that Iran exports fall faster and more than new capacity can ramp-up, with high uncertainty on the level of US potential waivers." Those fears have since eased, but a committee of OPEC members and allied countries recently warned that producers may begin cutting output once again. Russia's TASS news agency reports that Russia and Saudi Arabia are in bilateral talks to orchestrate another round of output cuts when producers meet next month. On Wednesday, Trump said oil prices could easily spike and suggested his administration could moderate its Iran policy. "We're going to let some of the oil go out to these countries that really do need it because I don't want to drive the oil prices up to $100 or $150, which could happen very easily. It's a very fragile market. Very, very fragile," he said. Trump added that granting the sanctions is "the absolute right decision" and the sanctions will "get tougher as time gets by — maybe — but I don't want to have any effect on the oil prices worldwide where I drive them up, because I consider that to be a tax and I don't like taxes."